On July 8, 1996, following a prolonged debate on the legality of nuclear weapons and their use, the International Court of Justice (ICJ) issued a momentous advisory opinion that would influence the discussion of nuclear weapons use under the scope of international law for years to come. The United Nations General Assembly first considered the legality of nuclear weapons use in 1961 when it approved a declaration prohibiting the use of nuclear and thermonuclear weapons. More than 30 years later, in 1994, the General Assembly’s appeal to the ICJ for an advisory opinion on the issue would set into motion a series of dramatic hearings and oral arguments at the judicial branch of the United Nations, the highest court in the world on questions of international law. The ICJ decided to officially deliberate on a response to the UN General Assembly’s question asking whether the threat or use of nuclear weapons was “consistent with international law.” Oral argument on the issue began in November 1995. 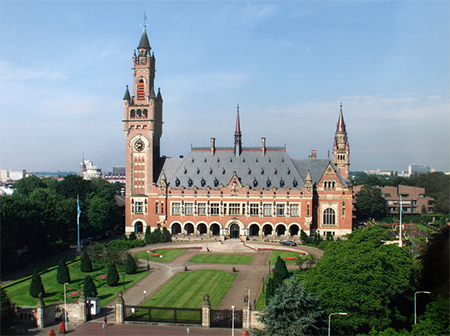 At the Peace Palace in The Hague, Netherlands, 22 states made oral arguments to the court on the issue, with 23 others providing written submissions. Discussion and debate on the topic ensued despite France, Russia, the United Kingdom, and the United States delivering oral arguments asking the court to decline to issue any answer to the General Assembly’s query. He noted that officials from the U.S. Defense and State departments expressed confidence that the ICJ’s opinion would not necessitate a change in nuclear deterrence policy and also did not rule out the use of nuclear weapons in “extreme circumstances of self-defense.” Nuclear weapons use as a response to another state’s use of chemical or biological weapons was also not expressly prohibited. On the side of disarmament and nonproliferation, Carnahan wrote that advocates could point to the conclusion of seven judges that “the threat or use of nuclear weapons would ‘generally’ violate international law, and that three more judges believe such use to be always illegal” as an accomplishment. At the time, several disarmament activists called the decision a “great victory” for their positions. Join the Arms Control Association and receive immediate access to Burrough's “Looking Back: The 1996 Advisory Opinion of the International Court of Justice” as well as archived issues of Arms Control Today. Arms Control Association members are granted immediate access to both current and archived materials through the web and the new mobile app.